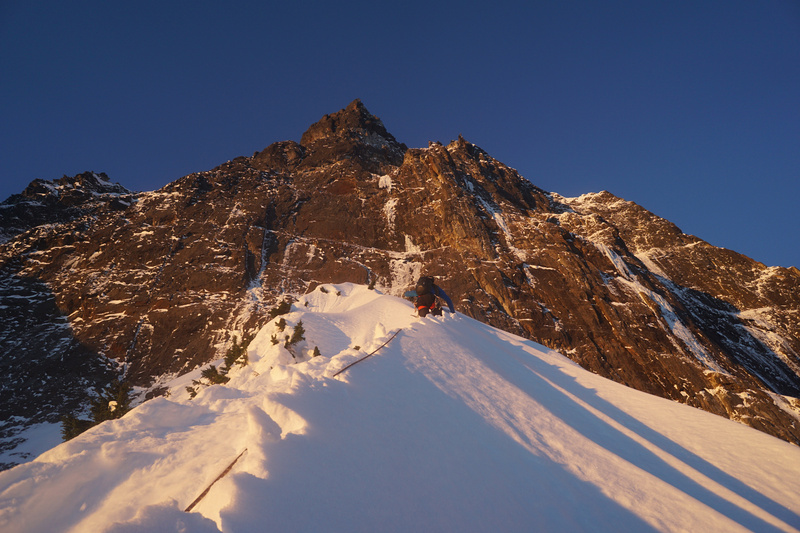 Conditions in the Canadian Cascades aligned at the start of the New Year and Marc-Andre Leclerc realized one of his long-standing goals with British climber Tom Livingstone—a winter ascent of Mt. Slesse's Navigator Wall. Livingstone arrived in Canada late January 1, "super jet-lagged." The weather was ideal, however, so he and Leclerc skied in to the peak January 2. They topped out the next day, returned to camp, then packed out on January 4. I've wanted to climb any/all of the big routes on Slesse in winter for years. It's such a cool peak that has so much to do in one little zone. I naturally was interested in Navigator, as I like the summer line in general, and this window seemed appropriate as the temperatures were mild and it's basically a big rock climb, so dry, mild conditions are ideal. I've kind of been 'projecting' the area for the last couple winters, doing trail work and getting gear cached in there to climb and ski when the weather is good. 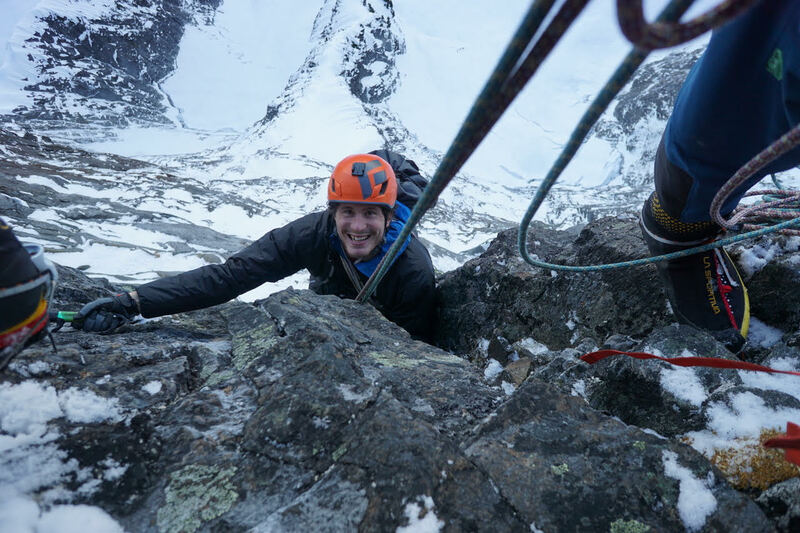 Last year Luka Lindic came out for a month but we dealt with some very cold snowy conditions and only managed smaller, easier climbs on the satellite peaks. Tom arrived just in time to use this last good weather spell and things just worked out. Brette Harrington and Kieran Brownie came up, too, and did the [first winter ascent] of a route called Labour Day Buttress that looks like a classy moderate, as well as the [first winter ascent] of Station D peak, by its east ridge, which was the last satellite peak without a winter route. Everybody was psyched and it was a great couple days out! The climbing was quite good and interesting with a couple more serious sections. We made some major variations to the summer route. Starting on a sharp snow ridge to reach the wall instead of slabs further left. After climbing the main central part of the wall on the summer route we reached a large terrace, which we followed around onto the upper south ridge and easier terrain to reach the south summit. The crux was probably M7+ with an R rating. There were a lot of other pitches in the M6 to easy M7 range, sometimes with sparse protection. Some classic frozen moss blobs helped us connect features on otherwise pretty homogenous compact terrain. Tom reckons it would be Scottish IX, whatever that means. On an Instagram post, Livingstone wrote, "Marc described the climbing as 'rowdy!' I agreed: after about three Scottish tech 8 or 9 pitches things were certainly getting a little crazy." Leclerc said he met Livingstone briefly while he was on a climbing trip to Scotland and this was the first time they have shared a rope. "I knew that Tom...had come to the Rockies and climbed the North Face of Alberta in mixed conditions; a good indicator that mixed climbing on Slesse would be up his alley, so when he expressed some interest I suggested he come out for some climbing!" Leclerc said. 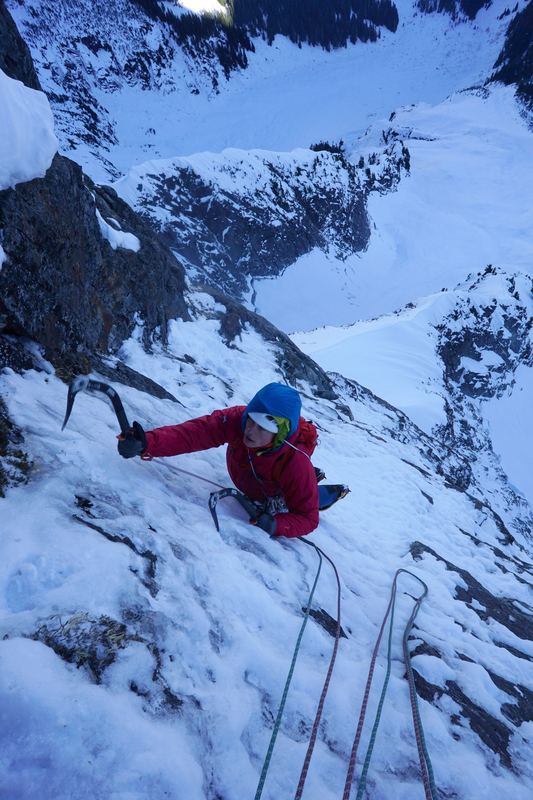 They hope to do another winter ascent on Slesse that's even more challenging. "There are a lot of other harder lines on the mountain," Leclerc said. "We're hoping this route was just our warmup for another project. 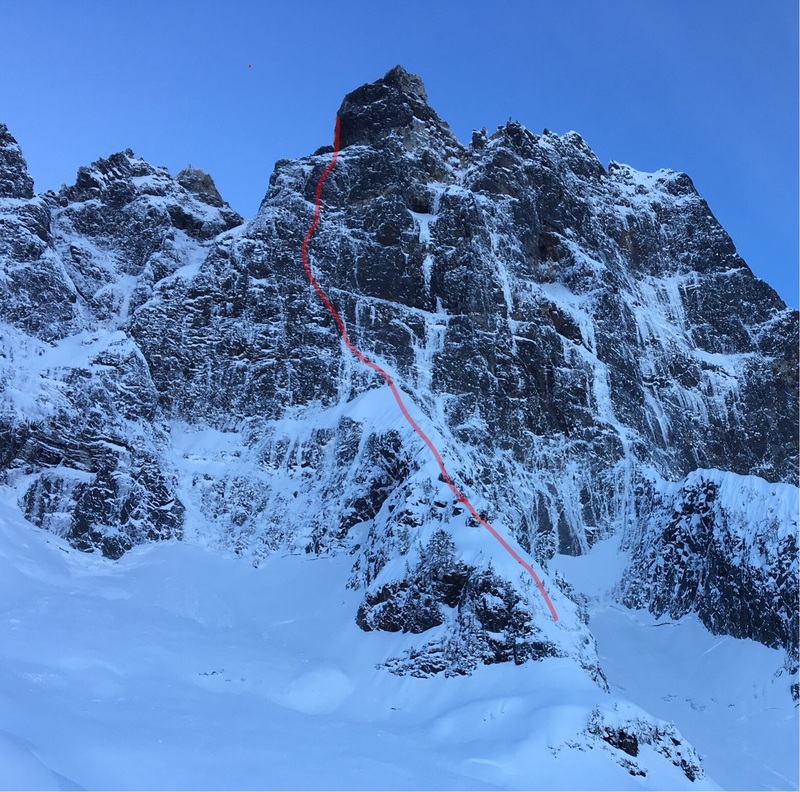 It was a super good climb and really satisfying to finally climb one of these harder lines on the mountain in the winter." "Fingers crossed we get some more good weather for the Mega Proj," Livingstone said. "It looks like a wild line...."
About the same time that Leclerc and Livingstone were on Mt. 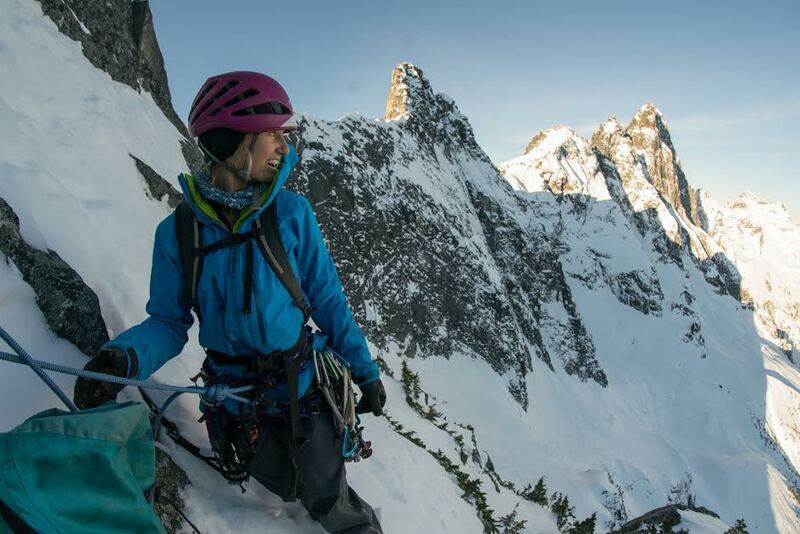 Slesse, Brette Harrington and Kieran Brownie made a linkup of two satellite peaks in the cirque. We climbed Labour Day Buttress on Labour Day Horn, making the first winter ascent of that line, but not of the peak, then descended by down climbing and making one rappel to the col between Labor Day and Station D. From the col we hiked across the arete to the east ridge of Station D. We wrapped around and onto the East Face climbing a line just right of the arete. 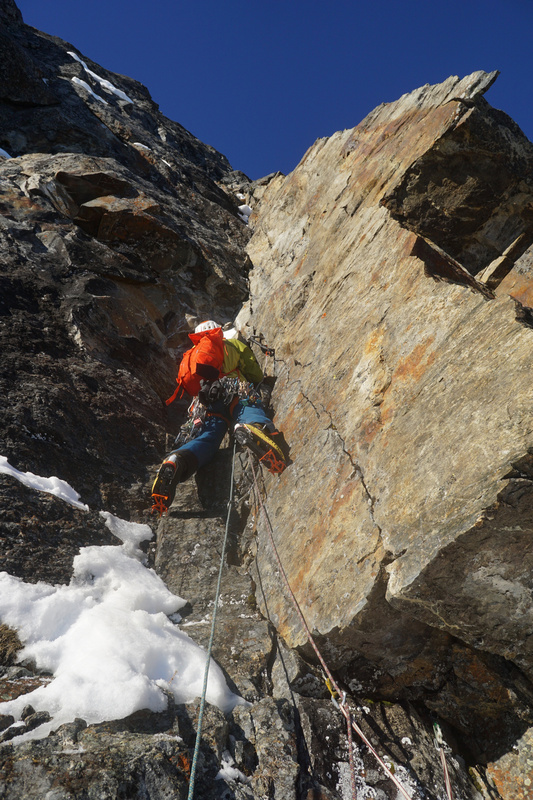 We topped this out in four pitches making the first winter ascent of the line as well as the peak. Both routes consisted of steep snow, a few steep ice sections, and rock cruxes.... Three main cruxes occurred on route, the first was a 5.8 hand crack, that mantles onto a slab, the second is a micro finger crack that takes the ice tools quite well, but gear is very slim (this can be avoided by a short down climb over to a snow ramp), and the third crux occurs on the fourth pitch as a mantle over a slabby rock buttress. I would grade the Station D climb [a bit harder], it is more sustained and steeper, involving many long run outs and committing moves. "It was a blast," Brownie said. "It's so hard getting a window for a temperate zone like that."